Frustrated by job-hopping and lack of advancement? Here’s help to gain focus for a better career. This video explains the difference between a job and a career, which can help your focus for a better career search. First, it’s important to understand the difference between a job and a career—to turn your frustrating job-hopping into a rewarding career. Jobs become a career when the jobs are part of an intentionally focused career path. INTENT, FOCUS, and UPWARD MOBILITY are the key differences. 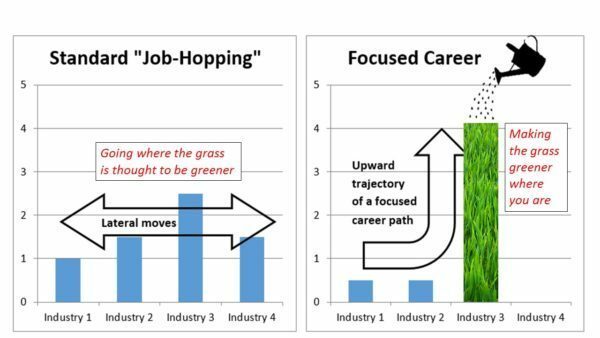 When the jobs you hold are part of an intentional and focused career path—with upward mobility and promotions, then the jobs are components of a career. The term “job” is often defined as: “Just Over Broke”. Holding different, unrelated jobs that do not allow advancement aren’t usually considered a “career” and the lack of advancement usually translates to lower compensation (i.e. lower pay). Your career is a job (or profession) held for a significant amount of time, defined as the intentional succession of jobs (promotions) which further your focused professional development and income within a specific industry or skill set. The goal is to start looking at your experience in terms of advancement in order to further your career. Otherwise, it’s just one unfocused “job” after another. With a job-hopping mindset, you’re chasing after other opportunities, believing that the next opportunity is better—INSTEAD of trying to further your career within a certain industry or skill set. In contrast, with a career mindset, instead of chasing after opportunities which are usually lateral moves—you’re CREATING your best opportunity with intent and focus by making the best use of your skills. In other words, you’re nurturing and making the grass “greener” where you are, INSTEAD of starting over OR making lateral moves. Make the most of your strengths in the job market! When you find the best fit, work with your strengths, and find a position that is valued, a superior work performance and optimal career path becomes EASY! Helps prepare for Salary Negotiations! Knowing how in-demand your skills helps you know the value for your skills. Had they focused on an industry or skill set, they would have been able to rise to a higher level of responsibility AND pay (i.e. compensation). What you LOVE to do—means you not only enjoy it; you’re motivated to do it. If you don’t LOVE what you’re doing, you’re more likely to get burnt out. Burned-out employees tend to have poor work performance, so they have a hard time getting promoted. What you are GOOD at doing—means you’re ENGAGING your tops skills and strengths. If you aren’t GOOD at what you’re doing, you’re likely to fail. Failure is a common reason to be passed up for promotions. You’re likely to be fired as well. It is also difficult to maintain motivation when you’re frustrated due to failure. What society VALUES—means that if the career is valued, it’s more likely to pay well, and it will be in-demand, this ALSO means you are less likely to quit or to be downsized. If what you’re doing isn’t VALUED by society, it won’t pay well. It can be difficult to remain motivated to remain in a career that is not financially rewarding. Even if it is emotionally and even spiritually rewarding, you will still need a retirement and/or emergency fund. Considering a career change? Thinking of turning your job search into a career search? INTENT, FOCUS, and UPWARD MOBILITY can help you avoid job-hopping or a dead-end job. 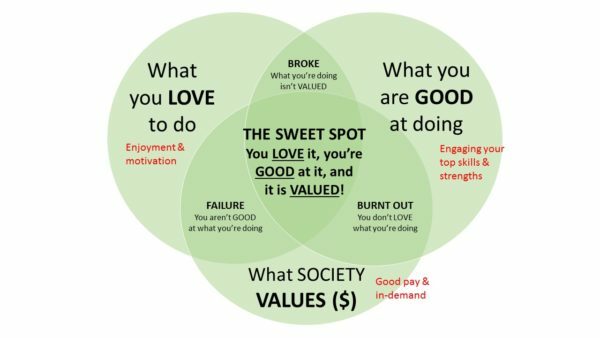 Find the “sweet spot” between what you LOVE to do, what you are GOOD at doing, and what society VALUES. We hope this video and article help you with the INTENT, FOCUS, and UPWARD MOBILITY you need for a successful career search. The best results come from contacting an expert at CrossRoads. Call 317-842-8881 for help with your career search.